Manchester City have signed Brazilian midfielder Geovanni on a free transfer. The 27-year-old, who has represented his country four times, joins on a one-year deal from Cruzeiro. And he brings a wealth of experience having previously played for Barcelona and Benfica, representing both Iberian clubs in the Champions League. He had been training with Portsmouth, scoring and setting up a goal in the weekend's friendly against Yeovil, but City moved quickly to tie up a deal. "It's been a dream for me to play in England, and this is a dream as well to come to a club like Manchester City," Geovanni told the club's wesbite. "It's great to be here after playing in Europe for a few years already, and I can't wait to get started. "Playing in England has been an ambition of mine, I watched a lot of Premier League games when I was at Benfica and now that I'm here I just want to start playing." 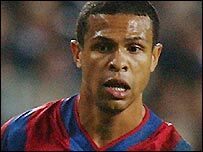 Having started out at Cruzeiro, Geovanni joined Barcelona for £11m in 2001. However, he failed to set the Nou Camp alight and was sent out on loan to Benfica after 18 months. That move to Portugal soon became permanent and he helped the club to a first league title in 11 years in 2005. In total he scored 17 times in 94 appearances for Benfica, including a diving header that sent Manchester United crashing out of the Champions League in December 2005. But 12 months ago Benfica opted not to renew his contract and he was allowed to return to Cruzeiro in a free deal. A move to Harry Redknapp's Pompey looked to be on the cards, particularly after his display in the 2-0 win against Yeovil. "He wants to play in England and he wants to stay with Harry at this football club," said his agent Regi Pereira. "If he likes it and Harry likes him then he will sign. He wants a change and likes England." But City stole a march on their Premier League rivals as new City manager Sven-Goran Eriksson wrapped up his third signing in a week following the arrivals of Rolando Bianchi and Gelson Fernandes. Geovanni is not set to join his new team-mates on their tour of Sweden and will link up with them when they return from Scandinavia.